Background In 2014, we recognised that the pace of admissions frequently exceeded our ability to assign a hospitalist. Long patient wait times occurred at admission, especially for patients arriving in the late afternoon when hospitalist day shifts were ending. Our purpose was to redesign hospitalist schedules, duties and method of distributing admissions to match demand. Design We used administrative data to tabulate Hospital Medicine admission requests by time of day and identified mismatch between volume and capacity with the current staffing model. We determined that we needed to accommodate 29 admits per day with peak admission volume in the late afternoon and early evening. The current staffing model failed after 22 admits. To realign staffing around patient admissions, we organised a series of Lean quality improvements, starting with a 2-day event in July 2014, and followed by a series of Plan-Do-Study-Act (PDSA) cycles. The improvement team included hospitalists, residents and administrators, and each PDSA cycle involved collection of feedback from all affected providers. Strategy At baseline, our hospitalist group had six daytime and two nighttime services, including teaching services and attending-only services. Four of eight services were available for admissions, while four were rounding-only. Admitting capacity (patients per day) was 22. 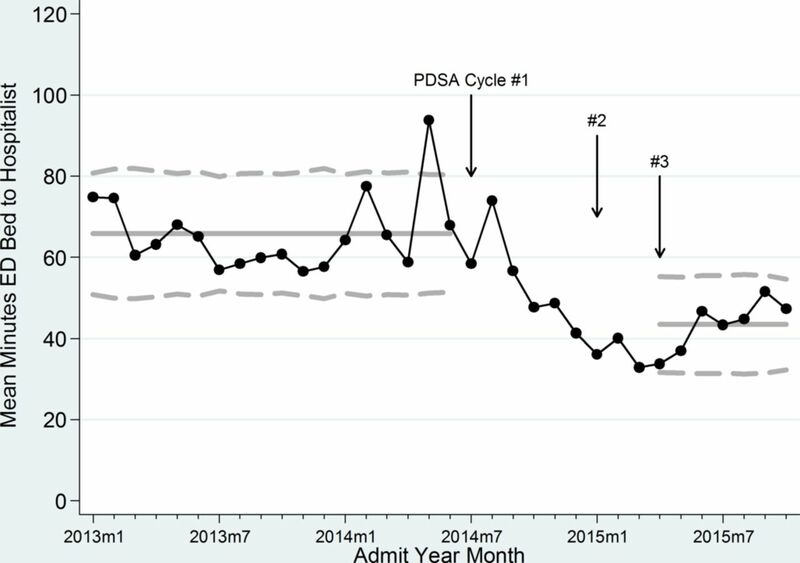 Through three PDSA cycles, we successively adapted our staffing and admitting model until the final staffing model aligned with patient admissions. The final model included different shift start times, use of all 10 shifts for admissions and addition of an Advanced Registered Nurse Practitioner (ARNP) service. Results Admitting capacity increased to 30. We confirmed success with follow-up data on patient wait times. Emergency department mean patient wait times for admission decreased 36% from 66 to 43 min (p<0.001). Conclusion Quantifying admission demand by time of day, then designing work schedules and duties around meeting this demand was an effective approach to reduce patient wait times. In early 2014, at Virginia Mason, we recognised that the pace of admissions to our service frequently exceeded our ability to assign a hospitalist to the patient, contributing to long patient wait times. Patient wait times were particularly long for patients arriving in the late afternoon or early evening when hospitalist day shifts were ending. Accordingly, we undertook a quality improvement project to redesign hospitalist schedules, duties and method of distributing admissions to match admitting capacity and admission demand. The objective of this manuscript is to report on the process and results of that quality improvement intervention. Virginia Mason Medical Center (VMMC) is a 336-bed acute care hospital in Seattle, Washington, and serves as a referral centre for Washington, Idaho and Alaska. The Hospital Medicine service at VMMC, consisting of 26 hospitalists and 30 Internal Medicine residents, had responsibility for all medical patient admissions, excluding those who were directly admitted to the critical care unit, surgical service patients and patients on the inpatient rehabilitation service. The Hospital Medicine service was also responsible for patients cared for in the short-stay emergency department (ED) observation unit. Long waits for hospital admission from the ED may increase ED crowding, which in turn may contribute to delays in diagnostic and therapeutic care. In addition, delays in admission may decrease the likelihood of establishing a therapeutic physician–patient relationship during the first encounter with a hospitalist, detract from patient experience of care and contribute to physician burnout.1–4 One study suggested increased mortality rates as wait time in the ED increased.5 Admission wait times are related to a variety of factors, including the availability of a hospitalist, bed availability, nursing coverage, and availability of transport and support services. To determine underlying causes for our delays in patient admission, we used institutional billing system data and ED admission logs to determine the number of Hospital Medicine admission requests at different times of day. From the 3102 consecutive patient admissions in the first 5 months of 2014, we calculated the average number of new patient admissions for each 2-hour block throughout a 24-hour day, generating a demand curve of cumulative daily admissions versus time of day. The demand curve illustrated the maximum pace of arrivals occurring in the late afternoon and early evening. When we compared this demand curve to the number of admissions each hospitalist could accept for each shift, we found that the current staffing model failed after 22 admits (figure 1), meaning there was no longer a hospitalist available who could accept another admission. Based on our demand curve, this failure occurred generally in the late evening, though in days with high demand, system failure could also occur in the afternoon. Admission plan compared with target demand at baseline. We identified several other factors that contributed to admission delays. First, because only half of the teaching services were admitting on any given day, they would often be responsible for admitting consecutive patients, which led to increased wait times. Second, the daytime services would often reach their admission limits (‘cap-out’ or ‘time-out’) before 19:00, leaving all additional admissions to wait until the night team arrived. In effect, some hours of the day were oversupplied with admitting capacity, while other hours of the day were undersupplied. Our institution has, for the past 15 years, used Lean applied to healthcare as a management approach and quality improvement model, which we term the Virginia Mason Production System (VMPS). A foundation of the VMPS is empowering the front-line workers to affect change through multidisciplinary quality improvement events of 2–5 days. These events are structured around collecting baseline data, developing improvement interventions and trialling the interventions through Plan-Do-Study-Act (PDSA) cycles. From the baseline data, we concluded that the structure of the hospitalist staffing model was contributing to the delays in admissions. To improve the hospitalist staffing model, we undertook a 2-day multidisciplinary quality improvement event using the VMPS approach and tools, consisting of mapping the current process, identifying barriers contributing to delays, developing solutions and testing the solutions through multiple PDSA cycles. The improvement team included hospitalists, residents and administrators, and each PDSA cycle involved collection of feedback from all affected providers. The goal of this improvement event was to redesign the hospitalist schedules to create appropriate supply of physicians throughout the day to meet the patient demand. Since a system capable of handling the average patient demand would fail on 50% of days, we developed our system with a target capacity 2 SD above daily average admission volume (29 admissions per day). Through the quality improvement event, the team was asked to develop a series of interventions focused on changing the hospitalist shift schedule, assigned duties and method of distributing admissions until our capacity to accept admissions matched or exceeded target demand. The plan was to trial through PDSA cycles, with implementation facilitated through participation of different stakeholders in the improvement event. In the initial pre-intervention admission process, hospitalists served in one of four roles at any given time—teaching service, float service, swing shift or night shift. The four teaching services were traditional internal medicine teaching daytime services from 07:00 to 19:00 that each included one attending hospitalist, one senior resident and two interns. The teaching services each had a cap of eight patients per intern, sixteen patients in total and admitted patients every other day. The two float services were daytime services from 07:00 to 19:00 that were each manned by one attending hospitalist alone. The float services seldom admitted patients, instead focusing on rounding on swing shift admitted patients. The swing shift was a daytime service from 14:00 to 00:00 and was manned by one attending hospitalist. The swing doctor admitted up to six patients daily and did not do any rounding. The night shift was a night service from 19:00 to 07:00 that included one attending hospitalist, one senior resident and two interns. 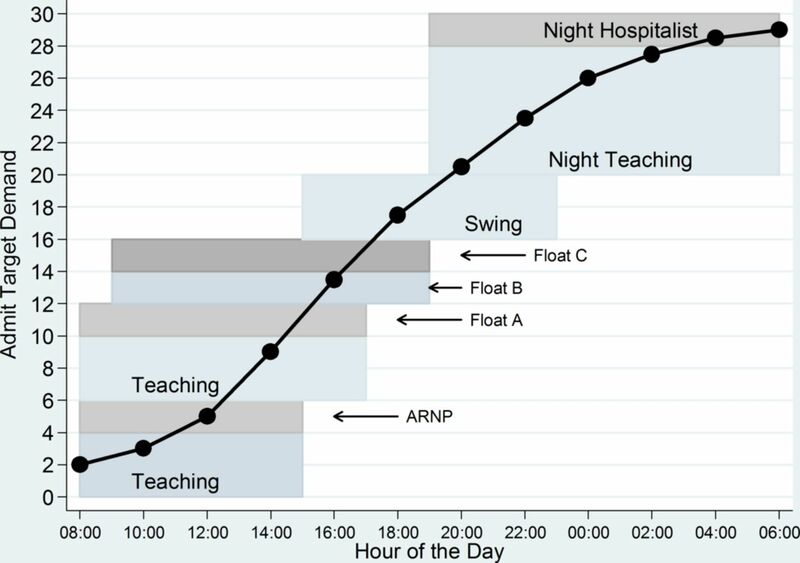 Importantly, the only services that admitted patients on any given day were two out of four of the teaching services (admitting until 17:00, to their caps), the swing shift (admitting until 22:00, max of six patients) and the night shift (admitting to residents’ cap of eight patients total, with additional patients admitted by the night hospitalist alone). The remaining teaching services and all the float services were rounding only and did not admit patients. Admitting capacity with this baseline model was 22 patients per day. Figure 1 shows the number of admissions we could accommodate by time of day compared with target demand. Our four teaching teams moved from every other day admitting to daily admitting. Each team was asked to contribute two admissions every day (one per intern). Night time admissions were assigned to day teams with the intent of preserving capacity for one admission for each daytime intern. A standard daytime admit sequence was developed so each team rotated from admitting early in the day to admitting later in the day over a 4-day cycle. This was intended to allow for some early days leaving work balanced against other later days for each team member. The float and swing services did not change, with the swing doctor accepting the next six admissions and the night team accepting the remainder. In this system, six of our eight services were available for admissions while two were dedicated to rounding. Admitting capacity in this model increased to 24 patients per day. Our swing service was eliminated. Instead, the swing hospitalist became a third float service (float C). All three float hospitalists were asked to be available to admit two patients every day. These doctors were added to the standard admit sequence with the intent of one admission coming early in the day and the second coming later in the day. The rounding work previously assigned to two hospitalists was spread over three hospitalists. The start time of the float C service was defined as 09:00 rather than our usual 07:00. This adjustment in start time was intended to shift some of our admitting availability later in the day to better fit with peak admit demand hours. A Monday to Friday daytime Advanced Registered Nurse Practitioner (ARNP) service was also added at this time. The ARNP focuses on observation patients and is available to admit one to two observation admissions early in the day. In this system, all nine of our services are available for admissions with the daytime services sharing both rounding and admitting work. Admitting capacity in this model increased to 25 patients per day. Along with float C, the start time for float B was moved from 07:00 to 09:00 to better fit with late afternoon admission demand. The swing service was reintroduced, now on a Monday to Friday schedule, 15:00 to 00:00. This reintroduction was made to add admitting availability during peak admit demand hours, as we discovered in our PDSA cycles that the night team was frequently arriving to many patients waiting for admission. The swing service was staffed by a second or third-year resident on 70% of days, and by an attending hospitalist on remaining days. In this system, all 10 of our services contribute to admissions. Admitting capacity in this model increased to 30 patients per day. Of note, full time equivalent (FTE) increased in total by one ARNP and one Doctor of Medicine (MD) over the study period. Figure 2 shows the number of admissions we can accommodate by time of day plotted against target demand in our current system. Admission plan compared with target demand at end of study. 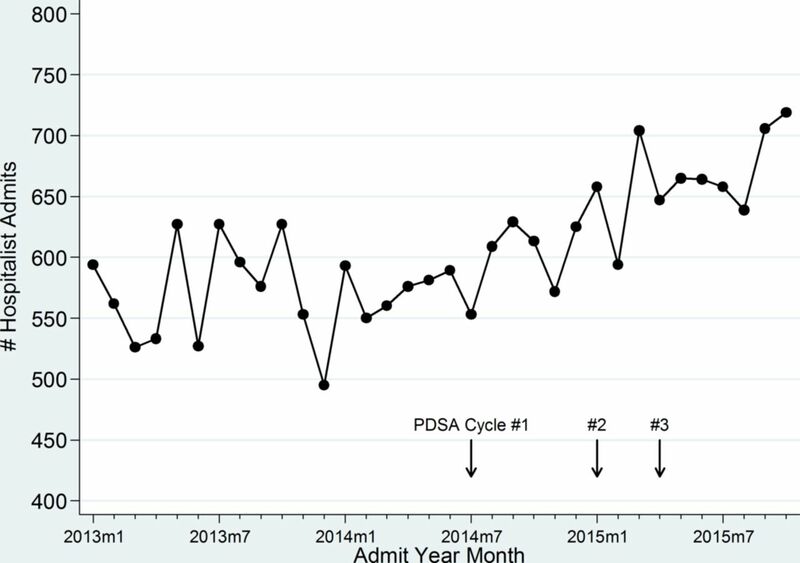 To assess success of each PDSA cycle's new staffing model, we analysed patient wait times, and hospitalist departmental professional costs. Patient wait times were abstracted retrospectively from the electronic medical record. All patients admitted to the hospitalist service from 1 January 2013 to 31 October 2015, including admission through the ED as well as scheduled admissions; patients referred from outpatient clinics; and transfers from other institutions were included (table 1). Patient wait times for admission was determined for ED admissions only, from the electronic health record (EHR), measured in minutes from the time of ED request for admission (a discrete order type in the EHR) to the time hospitalist admission orders were present. Wait times for other admission (eg, transfers, scheduled admissions) were not determined, as wait times for admission for such patients was highly variable, largely outside of the control of the hospitalist service (eg, dependent on patient transportation and preferences), and difficult to measure (eg, no definable starting time for when admission was requested). Professional costs for the hospitalist service were determined as monthly cost per discharge. Cost per discharge was the total professional costs of the service (MD and ARNP salaries and benefits, with allocated proportions of salaries of the division manager and administrative assistant) divided by the number of discharges. This cost per discharge metric is an efficiency metric used internally to track hospitalist staffing requirements and to benchmark staffing levels against other institutions. Cost per discharge was measured to account for different numbers of hospitalist providers as opposed to the structure of the hospitalist shift schedule affecting patient admission wait times. For the analysis, January 2013–June 2014 was considered the baseline period. The first intervention started in July 2014, and the second intervention started in January 2015. The final intervention started in April 2015 with April 2015 through October 2015 considered the postintervention period. Data were analysed using t-test for continuous variables and Χ2 for proportions. A Wilcoxon rank-sum test was used to compare medians for highly skewed admission time data. Time series data were plotted graphically using run charts. Patients admitted to services other than the hospitalist service were used as a control group. All analyses were performed using STATA V. 12.0 (Stata). Hospitalist service admission volume overall increased over the study period from 18.8 admits per day on average to 22.0 admits per day on average, representing 17% growth (p<0.001) (figure 3). Of these, the number of ED admissions increased from 11.4 patients/day during baseline to 13.5 patients/day postintervention (p<0.001). Number of hospitalist admits by month. During the study period, there were a total of 12 699 ED admits to the hospital for patients over the age of 18, with n=6284 during the baseline period, n=3518 during the intervention periods and n=2897 during the postintervention period. Forty ED admission patients were missing the bed request time and were not included in the analysis. The mean time from ED bed request and hospitalist admission orders was 66 min (SD=111, n=6244) during baseline and 43 min (SD=95, n=2897) postintervention (Student's t-test p<0.001). (figure 4). During the high volume hours of 06:00–18:00, the median time from ED bed request to hospitalist admission orders was 60.0 min (n=4110) during baseline and 33.0 min (n=1885) postintervention (Wilcoxon rank sum, p<0.001). During the low volume hours of 18:00–06:00, the median time from ED bed request and hospitalist admission orders was 53.0 min (n=2134) during baseline and 26.4 min (n=1012) postintervention (Wilcoxon rank sum, p<0.001) (figure 4). Statistical process control chart (X-chart) for mean, upper confidence level and lower confidence level, patient wait time (in minutes) by month from emergency department (ED) bed request to hospitalist admit order. PDSA, Plan-Do-Study-Act. Our expenses increased due to adding two new providers during the trial. However, discharges per month grew at a faster rate, thus leading to reduced cost per discharge. Cost per discharge decreased from $367 to $187, representing 49% improvement (difference $180, 95% CI 121 to 240). Excessive ED wait times, representing ‘admission bottleneck,’ cause crucial delays in care, and are a function of insufficient or inefficient admitting capacity.6 Bottlenecks are particularly apparent at shift changes and transitions of care.7 It has been the experience of many hospitalist groups that distributing admitting capacity among multiple services as opposed to a ‘dedicated admitter’ increases timely admitting capacity, improves continuity of care and can increase patient satisfaction.8 It is with this understanding that we have pursued analysis of admission flow at our hospital, and designed accordingly the timing and allocation of hospitalist services to distribute admission workload. This strategic redesign of the hospitalist admitting schedule has led to decreased wait times, as well as improvement in the subjective hospitalist experience, even while total admission volume has increased over the same time period. Furthermore, as healthcare costs in the nation have grown, the emphasis has shifted from volume to value-based healthcare. Because of hospitalists’ lynchpin role in every aspect of inpatient care, they are uniquely positioned to drive successful local-based initiatives to improve value.9 For example, it has been found that resource utilisation can be optimised in teaching hospitals by triaging patients queued for admission to different types of hospitalist teams (eg, non-teaching hospitalist teams vs resident-based teams). A study by Myers et al found improvement in key outcomes including cost and length of stay by assigning low-risk chest pain patients to non-teaching teams.10 Our study demonstrates one example of a systemic overhaul in scheduling that has led to decreased inpatient costs. This has crucial implication for patient and hospital alike in terms of decreasing wasted healthcare resources and maximising value-based reimbursement potential. There are limitations to consider in this study. First, this was a single-centre study, and as such there is the natural question of generalisability. We consider the specific characteristics of our single centre and note that Virginia Mason is an 336-bed, acute care, community-based hospital, with around 20 Hospital Medicine admissions per day for a Hospital Medicine group that includes a total of 26 hospitalists and 30 internal medicine residents. It is likely that our dramatic improvements in wait times and reductions in costs may be less pronounced in a higher-volume and/or lesser-staffed hospital. Yet, we do postulate that the principles of distributing admitting capacity among providers, and strategically matching capacity with demand, are bound to be successful—although to varying degrees—in any and all hospital settings. Second, many factors were considered when evaluating our increase in admission volume. Seasonal effect, demographic changes, ageing population, hospital location in a rapidly growing urban area and national healthcare changes may have contributed, though were not easily quantified. In addition, it would appear that our overall increase in admission volume was in large part because we were able to create more capacity to accept admissions during the time of day when referring providers tend to request admissions. Our overall ability to accept outside referrals in a competitive non-single payer healthcare environment increased as our capacity increased. Third, this was a quality improvement study and used a series of PDSA cycles with ‘measurevention’, where factors were measured and immediately intervened on, repeatedly. In such a process, we wonder about the Hawthorne effect research bias. It is possible that providers modified, and specifically, improved their practice to be more efficient, either subconsciously or consciously, because of their awareness of being studied. If this were the case, we would expect that our results would appear better than the truth, especially for wait times, and would be less likely to be sustained after the study period was concluded. However, it is reassuring that we have 30-day and 90-day remeasures after the study period that have demonstrated sustained improvements in wait times and costs per discharge. It remains to be seen if the results are sustained after longer periods of time poststudy. Fourth, we note that the primary goals of this study were to improve patient wait times and hospital costs, and provider experience, namely provider satisfaction, was a secondary aim. Our satisfaction data was limited, and further it is possible that initial improvements in provider experience may not be sustained long term as providers become accustomed to the new schedules and notice other drivers of dissatisfaction. Lastly, we caution that the extraordinary successes of this study were contingent on staff and provider engagement in finding and testing potential solutions. Virginia Mason is unique in its commitment and dedication to quality improvement, and as such there is a strong culture of exploring and enacting changes to the status quo. There is well-established precedent and process to pursuing quality improvement work at our hospital, including an appreciation for the importance of laying groundwork among the staff for any considered interventions. In our particular study, administrators and project leaders facilitated numerous meetings, surveys and one-on-one discussions with Hospital Medicine providers for a team-based approach to intervention roll-outs. Hospital Medicine providers were given ample opportunities to provide feedback, and project leaders were receptive. This extensive groundwork, collaboration and team approach was imperative to the success of our intervention. While we believe that our results can be replicated in any hospital setting, we note that the most successful quality improvement work is founded in a progressive culture with willing staff. Quantifying admission demand by time of day, and then designing work schedules and duties around meeting this demand can be an effective approach to reduce wait times and cost, and improve the experience of practicing Hospital Medicine. We identified significant decreases in patient admission wait times, despite increasing patient volumes, associated with changes in the staffing model to accommodate the times of peak admission.
. Avoid bottlenecks. 2008 www.the-hospitalist.org (accessed 5 Nov 2015).
. Hospital groups Might do better without Daytime Admission shifts. Morning Meetings 2015 www.the-hospitalist.org (accessed 1 Nov 2015). Contributors All authors contributed to research design, data analysis, manuscript writing and editing, and approval of the final manuscript.